For mother nature. Because as pictured below, inside is a small cute plant and—seeds? Yes seeds. For sowing the earth with goodness. Just be careful not to hurl one of these in public unless you want to be mistaken for a terrorist. But as a work of art and a clever way to cultivate plants, we have to commend this flower grenade. Flowers are nice, especially when you smell them and such. 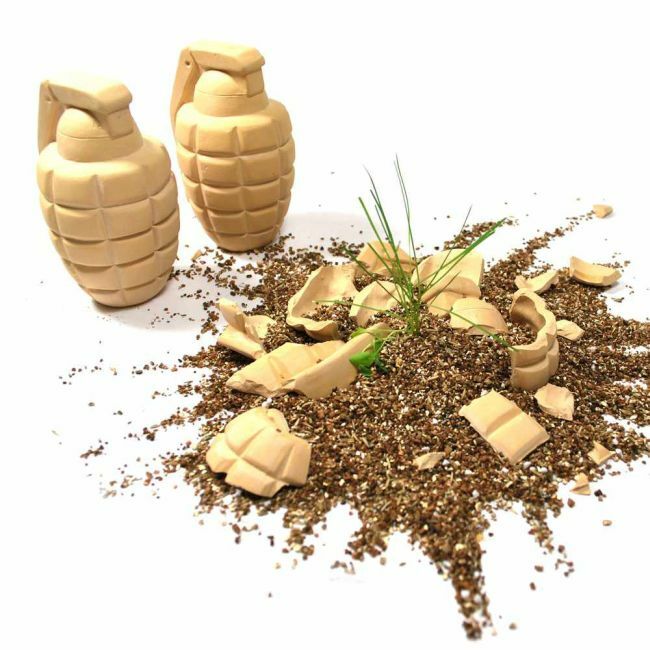 The interesting part is the current line of Flower Grenades contain seeds of Buttercup, Poppyes, and Ryegrass. Their true purpose, however, is quite noble. As the product page marketing suggests, the Flower Grenades should be hurled at vacant lots and other municipal spaces in a state of disrepair. That way, a much needed greening of the urbanscape is subversively enacted. Clever, clever. If you’re wondering about the material the grenade is made of, don’t fret. It’s just clay. Fragile clay. The exterior at least. Inside are the seeds and a little soil. It will take some time before they grow as a matter of course, maybe as long as three weeks. But when you next walk in your neighborhood and the ambience is much more natureful, you can thank yourself for throwing grenades. Flower Grenades. A final reminder: You simply throw these at a ‘target.’ There’s no pin to detach. Carry a bunch of these with you and you’re an eco-Rambo.